Ontario’s Chief Justice, Annemarie Bonkalo recently signed an order approving the fine for distracted driving to increase from $155 to $280 effective March 18, 2014. Want a copy of the Judicial Order? Here you go. Short, sweet and to the point. This fine increase for distracted driving in Ontario has made provincial and national headlines. I really don’t know why as I think the fine being set so low is an embarrassment and an insult to the families and accident victims of distracted drivers. Presently, the fine for distracted driving is just $155. That’s it. Minimum wage in Ontario just went up to $11/hr. That’s under two days of work over a 7.5 hour work day to pay off a distracted driving penalty for almost killing somebody or rendering them a quadriplegic. So, what’s the big deal and why be so hard on distracted drivers? I mean, everybody seems to do it. It’s just a phone call, a quick text or a simple email; right? I’ve seen a Kardashian send out a VINE Video while driving, so it’s gotta be cool to do it! Distracted driving is just as bad as dunk driving. Yes, I made the comparison. Shocked? Bold words, I know. 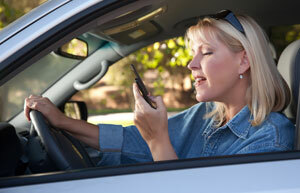 But, our law firm sees the realities of distracted driving every day. To give you evidence of how serious the problem is, the US Government has its own OFFICIAL WEBSITE DEVOTED TO THE DANGERS OF DISTRACTED DRIVING. If you didn’t take the problem seriously before, maybe you will now that Barack Obama, the world’s most powerful world leader, got his own country to design a website and set up an agency devoted to increasing awareness. But I’m NOT convinced that an increased fine in Ontario will do any good. A $280 penalty for a motorist shouldn’t break the bank when you consider to cost of insurance, gas and car maintenance. The penalty does not match the crime. Is it a crime to text and drive? Just as the Kanagasbapathy family of Toronto. In August 2013, 52 year old mother of 2, and grandmother, Ranjana Kanagasabapathy was boarding a TTC bus Steeles near Middlfield Rd. in Toronto. At around the same time, a motorist, Vincente Babobe Abris was busy on his cell phone and not paying attention to the road. What happens next? Because Abris isn’t paying attention to the road, he plows at full speed into the idling TTC bus which was picking up and dropping off passengers. The result? 12 TTC passengers sent to hospital with serious injuries. Ranjana Kanagasabapathy dies as a result of the collision. Are you telling me that a $280 FINE is a suitable penalty for an accident causing bodily injury, catastrophic injury and possible death? Are you telling me that an increase of a fine to $280 is going to act as a deterrent to prevent people from distracted driving? The only way to prevent people from distracted driving is to firstly increase the fines even more, and to add demerit points to offenders. Distracted driving ought to be treated with the same disdain and viewed in the same negative light as drunk driving. Some people ask me if distracted driving is just a Toronto/GTA problem. Based on what I’ve seen, it’s certainly NOT. People all over the province have cell phones. Strangely, the more remote the area, sometimes the more dependent people are on their mobile devices. It doesn’t matter if you’re in Toronto, London, Peterborough, Milton or Owen Sound. People text, email and speak without bluetooth headsets and drive. The crime doesn’t discriminate. Rich, poor, white, black, male, female. It doesn’t matter. We all have done it. The moment we take their eyes off the road to focus on something else, is the moment when bad stuff can happen on front on the road. It’s in that moment that a life can be saved or ruined. Unfortunately, our office sees the “ruined” more than we see the “saved“. The theme of distracted driving reminds me of a Simpsons episode. Homer Simpson is playing a game called “Distracted Driver” on his IPAD. He’s holding his IPAD on his steering wheel. He’s simultaneously steering in the video game, and steering his car in the real world. At the same time, he’s running over countless people on the road. Here’s a link to the Simpsons Wiki Page explaining what this was all about in case you didn’t get the gist. I think that we call all agree that making our streets, roadways and highways is of importance to all Ontarians. Hopeful, the Liberals, NDP and Conservatives can all agree to pass a private member’s bill to bring about real penalties for distracted driving instead of just a slap on the wrist fine. I’d be curious to see if all the parties can “get along” to bring about some real positive change instead of just saying “NO” to any good ideas from the other side of the floor by way of automatic reflex. Interestingly, when it comes it increasing your insurance premiums and cutting your benefits, all the parties seem to get along. It’s one of the few areas where all of the parties seem to agree, or don’t really understand what they’re doing. Enough law. On to more interesting matters. In Municipal Politics, Toronto Mayor Rob Ford was interviewed on the Today Show by Matt Lauer earlier this week. He was asked about his drug and substance use/abuse and tip toed around the question. When local news media asked him the same questions, he refused to answer any of them. Then, later on this week, when Rob Ford was asked why he only supported tax increases when they supported his projects/causes he walked away from the media. That was classic. Q: What are you going to do about our parks? A: This isn’t about parks. This is about our children and their future. Their future won’t be bright if we don’t lower taxes and get spending down. A: The only way we’re going to get good jobs is to attract business by lowering taxes. Q: What about health care? A: It’s no wonder everyone is sick with all these high taxes going around. We need to cut tax to make everyone healthier. Q: What about the environment? Being a right wing talking head looks easy. That robot would easily get 25% of the popular vote based on that platform alone. Add some savvy political marketing, PR and baby kissing, and you have a real contender.